Over 95% of the diamonds are described as intact, white octahedrons and aggregates. The PK150 caustic fusion results are summarized in the following table. Ken Armstrong, President and CEO of North Arrow, stated, "To recover such relatively high counts of +0.85 mm diamonds from the first kimberlite discovered at Pikoo is an exceptional result and establishes Pikoo and the northern Sask Craton as a new diamond district in Canada. PK150 was discovered as part of a short, 10 hole program completed earlier this year, and many priority targets remain on the 33,000+ ha property. One of the key benefits for the project is its location close to transportation and power infrastructure, lying within ten kilometres of Saskatchewan Highway 911." The PK150 kimberlite was discovered during a 2,002 m drilling program completed in July 2013 (please see North Arrow news release #13-13 dated August 7, 2013 for details). This drilling program and related diamond testwork is being funded by North Arrow as part of an option agreement with Stornoway Diamond Corporation (TSX:SWY) under which North Arrow can earn an 80% interest in the Pikoo Project. PK150 was tested by three drill holes and is interpreted as a 10 to 15 m wide, near vertical body, intersected over a 75 m strike length and it is currently open to depth and along strike. The kimberlite is comprised of dark grey hypabyssal kimberlite containing abundant olivine as well as common ilmenite and orange to purple garnets and less common chrome diopside. Internal country rock dilution is estimated as less than 8% and mantle nodules ranging up to 10 cm are common. 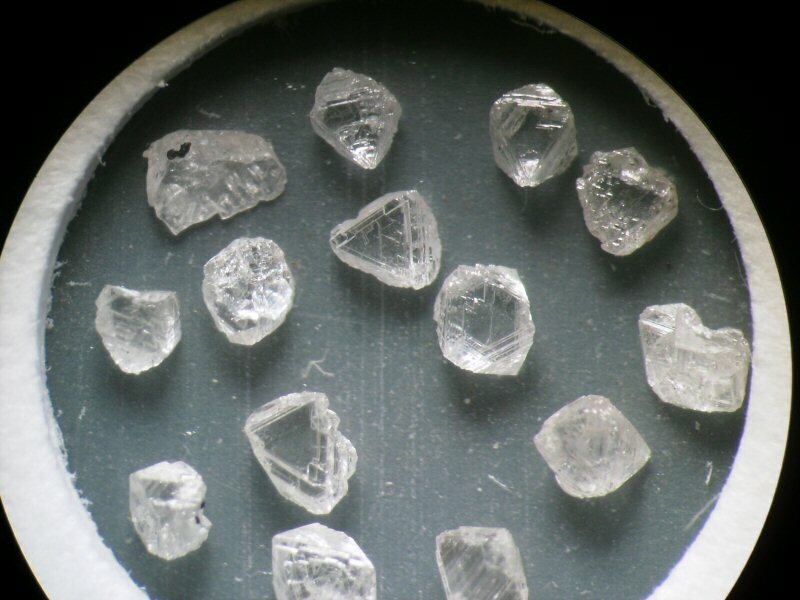 Recovered diamonds have similar, high quality characteristics across all size fractions, with over 95% described as intact white octahedrons and aggregates with lesser macles. A photograph of a selection of the diamonds can be viewed here: http://www.marketwire.com/library/20131104-909125.jpg. A study of the mineral chemistry of the kimberlites discovered in 2013, including PK150, is currently underway. This work will allow for a comparison to the compelling chemistry of the kimberlite indicator mineral trains identified within the 33,374 ha Pikoo property. This large project area hosts additional kimberlite targets and numerous anomalous KIM samples that require further follow up and target definition. Exploration plans for 2014 will be developed over the next couple of months; work is expected to include drilling, geophysical surveys and till sampling. Mr. Armstrong continued, "Today's news validates North Arrow's strategic approach of targeting and assembling a prospective portfolio of Canadian diamond projects that benefit from significant historical exploration, and are now at an advanced or drill ready stage. North Arrow is well positioned with more than $6 million cash on hand to further advance this new diamond discovery at Pikoo, to collect a 500+ carat diamond parcel from the advanced Qilalugaq Project in Nunavut, and to evaluate unexplained kimberlite indicator mineral trains at the Redemption and Lac de Gras Diamond Projects in the heart of the Lac de Gras diamond district of the NWT." North Arrow retains the right to earn an 80% interest in the Pikoo Project by completing an option work program consisting of 2,000 m of diamond drilling. The July 2013 drilling program and related diamond results announced today have fulfilled the requirements of the option work program and North Arrow shall provide notice to Stornoway of its intent to vest an 80% interest in the project, subject to a one time back-in right held by Stornoway. Upon receipt of the vesting notice from North Arrow, Stornoway will have a 60 day period in which to elect to increase its interest in the Pikoo Project from 20% to 40% by paying to North Arrow an amount equal to three times the costs incurred by North Arrow in connection with the option work program. The Company will hold a conference call and webcast on November 5, 2013 at 11:00 am ET where management will provide further information and context for today's announcement. Management will respond to questions from analysts and investors via the conference call. The conference call will be recorded and playback will be available after the event's completion by dialing toll free in Canada and the United States 1-800-408-3053 or locally, 905-694-9451 and entering the passcode: 7750286. The webcast of the presentation with voice recording will be available for one year following the call. Diamond results reported above are based on work completed by Microlithics Laboratories, Thunder Bay, Ontario, an independent mineral process laboratory facility. Quality assurance protocols, security and actual operating procedures for the processing, transport and recovery of diamonds conform to industry standard Chain of Custody provisions. As part of North Arrow's ongoing QA/QC programs, concentrate residues and other materials are subject to audit. Any significant changes to recovered diamond contents will be reported when available. The 2013 Pikoo drilling program was conducted under the direction and supervision of Barbara Kupsch, P.Geol., project manager for the Pikoo Project. North Arrow's diamond exploration programs are conducted under the direction of Kenneth Armstrong, P.Geo., President and CEO of North Arrow and a Qualified Person under NI 43-101. Mr. Armstrong has reviewed the contents of this press release. North Arrow is a Canadian based exploration company focused on the identification and evaluation of diamond exploration opportunities in Canada. North Arrow's management, board of directors and advisors have significant successful experience in the Canadian diamond industry. In addition to the Pikoo Project, North Arrow is also conducting exploration at each of the Qilalugaq (Nunavut), Redemption (Northwest Territories), Lac de Gras, (Northwest Territories), Mel (Nunavut), Luxx (Nunavut) and Timiskaming (Ontario) Diamond Projects.